Voice, keypad or app: With Brinton Security, you can enjoy multiple ways to control your security & automation system – whether at home, work or play. Easy to use color touch screen key panels that can be installed anywhere in your home. Crystal clear HD video for indoor or outdoor use that captures clips automatically. Control thermostats, lights, locks & garage doors with simple home automation. Security and home control is in your pocket and with you where ever you go. UL certified professionals are there for you in an emergency or other critical event. 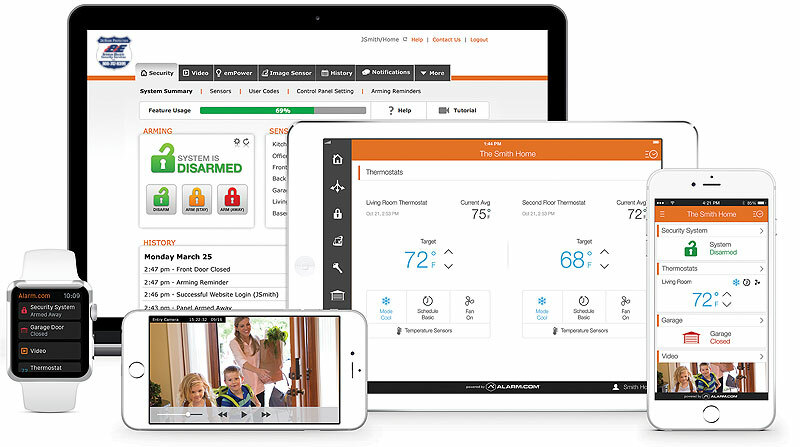 Keep control of your smart home from the palm of your hand with a single, intuitive app. Brinton Security will secure and protect your employees, property and critical assets from the dangers of intrusion, unauthorized access and fire. With 24 / 7 commercial alarm monitoring, we go above and beyond securing your main entry points to getting the authorities on site in an emergency. Security systems are our primary source for a security solution, however, we offer additional security options along with other solutions for your home including Home Theater & Whole House Audio, Camera Systems (CCTV), ​Personal Emergency Response Systems, Gate Systems, Intercom Systems and much more. Our certified installation team offers professional set up of your new system. Whether for your home or business, your sales professional will discuss all the the options that work best for you.